Right now, you have the opportunity to be coached 1-on-1 with Dr. John! Here is everything you need to become happier AND more successful! 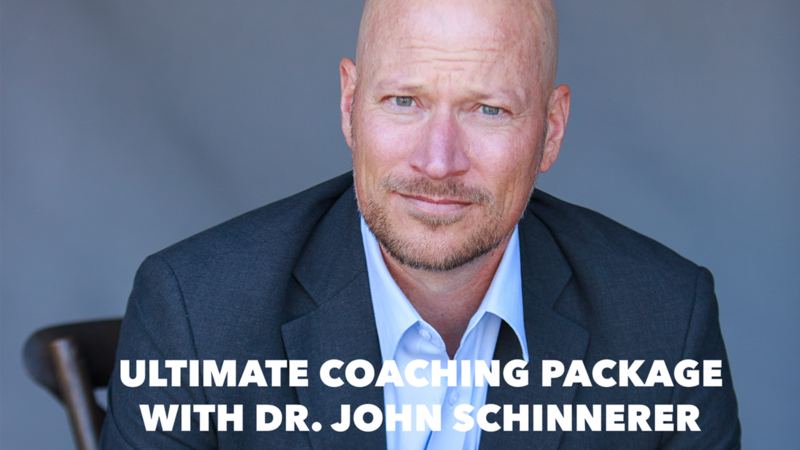 This Ultimate Coaching Package includes nearly 12 hours of individual, face-to-face coaching with Dr. John and over 25 hours of online teachings. Learn to master your mind and your heart - for a better marriage, more success at work and more impact in the world. It's not enough to make money. So many people have been sold a bill of goods that wealth is the pathway to happiness. It's not. It's part of the equation. It's necessary but not sufficient. If you are successful in your professional life but are unfulfilled at home, that's a problem. If you have a great marriage, and you aren't succeeding professionally, that's a problem. Learn how to get your life firing on ALL cylinders with Dr. John. This package gives you 35 hours of personalized training and education on essential life skills in communication skills, ways to create a successful, happy relationship, emotional management, stress management, mindfulness, goal setting, anger management, and proven ways to be more satisfied with life. At normal therapy rates, this is over $7,000 in training and life-altering education. For a limited time, this is on sale for $3,995. How much is your happiness worth? To begin, simply purchase your Ultimate Coaching Package and you will receive a confirmation email shortly. Once you have purchased your Coaching Package, please email us at Info AT GuideToSelf.com to set up your initial appointment. Immediately after making your purchase, you will be able to download a welcome letter, your copy of Dr. John's book, the Power of Mindset talk, and access to all your courses.